With the spring fishing season slowly approaching, anglers across the country are starting to keep an eye on their favourite streams and rivers. A big part of river fishing success is attributed to timing – with both water too high and muddied and water too low and clear being problematic, especially for trout. Fortunately, real-time hydrometric data (water level and flow) from across Canada is now available online. A similar site for United States hydrometric data is also available. A sample of data available is shown below. 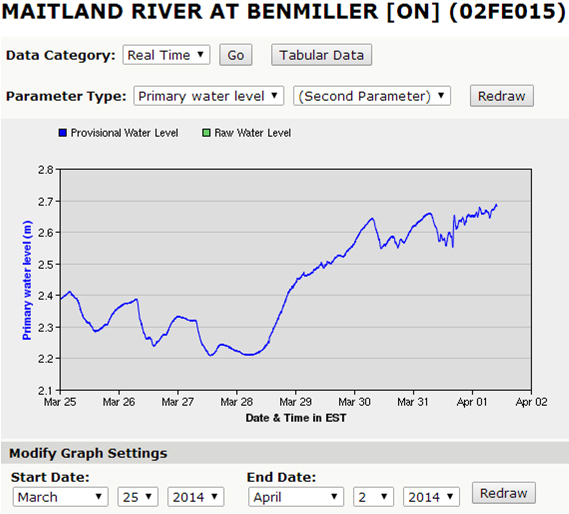 Water level data (m) for the Maitland River near Goderich, Ontario. You can look back at historical data to get an idea as to what normal high and low levels were. It may be also useful to check out data for the days when the river was perfect for you and then to look for similar trends in the future. Timing the river for steelhead has always been tough to do, especially if you don’t live close to the river and data such as this can be invaluable. For example, on the Maitland River in Goderich, Ontario during steelhead season, I’ve heard water level values of 2.1 to 2.3 m being good numbers to look for after a heavier flow from rainfall (i.e. a clearing river). Likewise, numbers around 1.0 to 1.2 m are good for the Bayfield river, a smaller lake Huron tributary to the south of the Maitland. By getting to know good values for a number of rivers you can adjust your target river destination depending on which one has optimal flow on the day you plan to be out. I’ll also be keeping an eye on levels for the Grand River and once the spring flooding from the snow melt subsides it should help indicate a good time to schedule a trip to the Dunnville area (mouth of the Grand) for catfish fishing. Map of water level and flow monitoring sites for Ontario. Rainbow Trout, Research, River FIshing, Steelhead. Also note: Ice conditions for the great lakes can be found at: http://weather.gc.ca/index_e.html – under marine tab (when available/appropriate season).